The Stormcloak Courier can be encountered on a few occasions during gameplay. 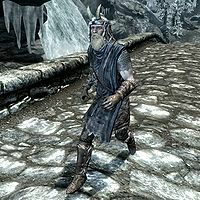 If you did not receive a suggestion from Ralof to join the Stormcloaks after completing Unbound, and haven't yet joined either side in the civil war, it's possible to encounter the Stormcloak Courier randomly, and they may even follow you into dungeons. Speaking to them will result in them telling you to head to Windhelm to speak with Ulfric Stormcloak to join up. They can also be encountered during A False Front, when you must retrieve their documents for Legate Rikke if you've joined the Imperial Legion. Attacking him outside of the related quest is considered a crime. They wear a Stormcloak cuirass, fur boots, fur gauntlets, and either a hide, scaled, or Stormcloak helmet. They carry a hunting bow and 12 steel arrows, a steel dagger, and either a one-handed weapon with a shield or a two-handed weapon. This page was last modified on 12 January 2015, at 14:06.